Slot machines stand out among the list of other gambling games both in virtual and land-based venues. Owning to the fact that slot is a game that requires the fundamentals of chances and sheer luck, it encourages gamers with immense excitements and thrills. The level of the adrenalin is sweeping off scale when the reels are spinning and a gamer is hoping for the best possible outcome. One can enjoy gambling at slots without any complicated rules, mental efforts and professional skills. This is the exact reason for this game being so popular among gamers of different age and experience. Land-based players just insert the token into the slot machine while virtual players press the starting button. Everything else depends on nothing else but fortune. Although slot game variations do not require complicated professional skills, some tactics may play a key role in terms of increasing the winning chances of a casino player when s/he interacts with a slot machine mechanism. 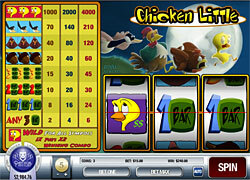 Slot machine chicken strategy is similar in some way to a play and run tactic. But while the latter supposes a strategic reaction to naked pulls as well as loss limits, chicken slot strategy intends running from one machine to another like a a chicken. You should run both if you have won and lost. If to draw the conclusion and describe it in a couple of words, the chicken slot machine strategy implies that a gambler should not play at one and the same automated casino machine several times. It is necessary to divide the gaming bankroll into several parts and play every part on a different casino slot machine. Moreover, it can include other popular tactics in accordance with a gambler's needs and requirements. Similar to chicken approach is the squirrels slot concept. Unlike imitating the chicken behavior and running from one machine to another it implies staying at the machine where you have manage to have a lucky spin. To be honest, there is no common sense in this strategy as it is one of the slot myths that do not take into consideration the evident fact that slot adventures simply based on pure accident and luck. The same can be said when it comes to the random number generator which controls the appearing symbols on the reels and does not rely on anything else but mathematical algorithm. What is really important is reasonable interaction with slot machines and rational bankroll management.